Candidates began their last day of campaigning on Saturday for Brazil's most polarised presidential race in decades that could elect a far-right former army captain who promises to crack down on corruption, ease gun laws and defend Christian family values. Front-runner Jair Bolsonaro, 55, has surged on widespread anger over rising crime, a drifting economy and the prospect of the leftist Workers Party returning to power. His closest rival is Fernando Haddad of the Workers Party, whose leader is in jail for receiving bribes. Final opinion polls on Saturday will show whether Bolsonaro has enough support to win the election outright on Sunday. If no candidate gets a majority, the race will go to a second-round run-off between the two top vote-getters on Oct. 28. Bolsonaro, who is recovering from a near-fatal stabbing at a rally one month ago, appealed to Brazilians to vote for him in a live Facebook feed for his home on Friday night. He asked them to give him a majority to avoid a second vote, which some polls have shown his leftist challenger winning. Haddad's support relies on the popularity of his mentor, former president Luiz Inacio Lula da Silva, who was barred from running due to a corruption conviction. Haddad will campaign on Saturday in Bahia state in the northeast of Brazil where Lula is still a hero because his government did much to relieve poverty. About 26 percent of voters say they have yet to decide who to vote for, according a Datafolha poll released on Thursday. 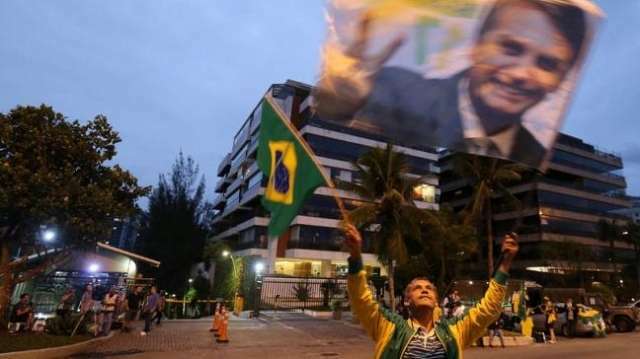 It showed outright victory by Bolsonaro was still possible but not likely. "We will accept the result whatever it is, there should be no doubt of that," Bolsonaro said. The assurance was aimed at calming fears he would call for a military coup if he lost. Bolsonaro, who is backed by a group of retired generals, said last week he would only accept victory. A Bolsonaro government would speed up the privatisation of state companies to reduce Brazil's budget deficit and relax environmental controls for farming and mining. It would also block efforts to legalize abortion, drugs and gay marriage. In an interview published on Friday by the newspaper Estado de Sao Paulo, one of the candidate's top economic advisers said Bolsonaro would push ahead with privatising state power firm Centrais Eletricas Brasileiras SA, or Eletrobras. However, former army General Oswaldo de Jesus Ferreira pledged to keep state oil giant Petroleo Brasileiro SA, known as Petrobras, in government hands. Hydroelectric dam projects on the Tapajos river in the Amazon basin that were stopped due to environmental concerns would be discussed again, Ferreira said.